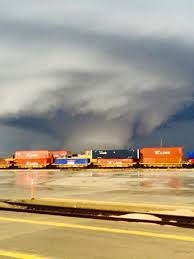 A tornado hit my hometown last Thursday night. I had never heard of a 'wedge' tornado before, but now I'll never forget it. A wedge tornado is wider than it is tall. I heard tell of one woman who was looking right at it and didn't see it for she could not discern the edges of it. It just looked like one massive storm cloud to her. To be safe, we spent some time in our basement, but the storm missed us by miles. Others were not so fortunate. Reports are that thirty lost their homes in Rochelle--- the town where I grew up. And fully half the town of Fairdale which is north and west of us, is gone. Two have died. Countless climbed out of their basements to find their worlds in shambles. On Friday morning I headed out early. I had seen the call for toiletries at the church where I grew up so I hit the store when it opened and stocked up on toothpaste and toothbrushes and started driving west. A small thing, yes, but in the wake of tragedy one wants to do something. I stopped at the church first where a handful of volunteers were organizing the gifts people were dropping off. I have known Linda since I was in high school for those many years ago I babysat her then young boys. She hugged me and shook her head and said, "Life is fragile." And oh, isn't it!? I stood with the pastor a while. Her house had been damaged, yes, but when they stepped outside after the storm had passed she and her family were devastated to see that their neighbors' homes were gone. Just gone. Her husband pulled out his phone and began to show me pictures of driveways to nowhere. Now I know that I am using this forum to 'work out' a story which I need to tell and will probably need to keep telling for some time. Thank you for bearing with me. At the same time, it is so that whenever we experience or encounter loss and hope, devastation and unexpected life, we get a window into what the disciples must have experienced that first Easter so long ago. No, of course, it would not be fair to compare them to family pets who in their terror fled for their lives even while that is exactly what they did on that fateful Friday. At the same time, before long they came to their senses and gathered together --- even those two who had made their way all the way to Emmaus realized the importance of being with the rest back in Jerusalem, especially after their encounter with Jesus over a meal. I don't know what would have become of them if Jesus had not made his presence known when he did. Indeed, perhaps if he had not told them to stay put for the time being they would have gone back to whatever their lives had been before they were called away from their fishing boats and other places of business three years before. But Jesus did stand among them. He reminded them his coming was for peace. He invited them to see for themselves that it was him. He ate a meal with them, proving he was not just a ghost. He spent some time teaching, one more time. He reminded them of all they had heard and seen and that though he would not be among them in the way that he had been, their work was just beginning. And before he left, he told them to stay put and wait. Wait for the power that was yet to come. So here is what I am wondering now. What does it mean to stay put and wait as Jesus told his followers to do so long ago? I wonder how it is they spent those days and weeks. And I wonder when it is that you and I are just to stay put and wait. Like that beautiful and loyal dog did as it sat in the rubble, trusting her family would return. And I wonder how it is we are called to use such waiting time. In his last words to them, Jesus tells them that when the time is right they will be proclaiming repentance and forgiveness of sins to all the world. And isn't repentance and forgiveness of sins always about reparation that makes true reunion possible? It has been heartwarming to see so many do what they can to make sure beloved pets are reunited with their families. I wonder if I have taken nearly seriously enough Jesus' call to be about this for all the people of this world --- that their reunions with God and with each other might be complete. And I wonder what it would look like if I would take that more seriously. Even knowing that our relationships with one another tend to be far more complex than those we share with our pets, still I wonder. And I wonder this, too. 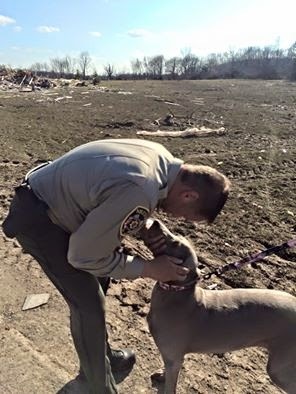 Take another look at the photograph of the sheriff and his dog which I shared above. What might it look like if I were even half as trusting as that beautiful animal? How might we live our lives differently if we did so knowing that one day --- and in some way --- every day even now, Jesus holds our faces in his hands just like that? All best as you recover from the tornado - not so much the debris as the psychological and emotional shock. Spent my share of childhood afternoons in the corner of the basement following the wailing of the tornado sirens in my home town. I was spared any direct hits, but friends and aquanitances were not always so lucky. I think that trusting God to be God through all things is ever my challenge, and I doubt I am alone.